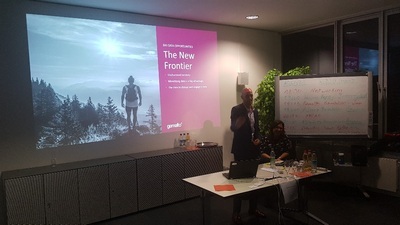 On November 8, 2018, Gemalto Connected Women Munich hosted an after-work event with Munich Women in Big Data at the Gemalto offices. 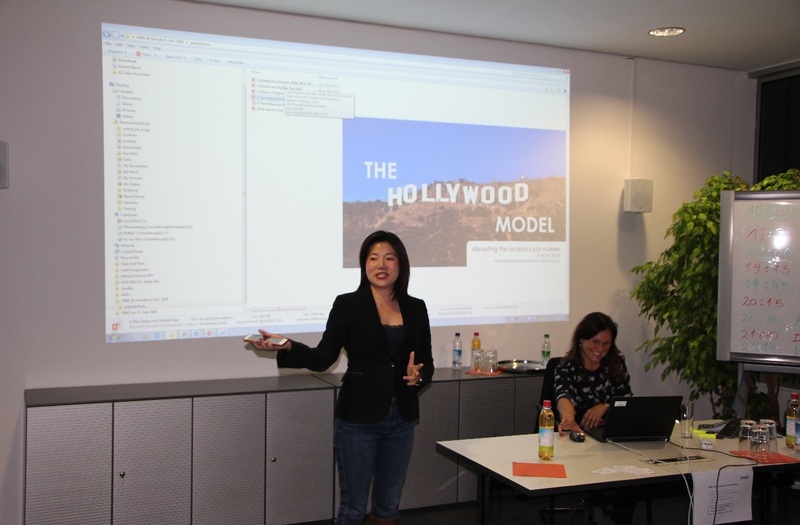 The main objective of this event was to present the Women in Big Data organisation, explain what Big Data is and how it is changing the way we live and work, and inspire women in Munich to improve their digital skills. Over 90 people attended, with an additional 30 on the waiting list due to limited space. Kendy Rannenberg, Business Development Manager at the Software Monetization Business Unit within Gemalto and Women in Big Data representative, welcomed the attendees. 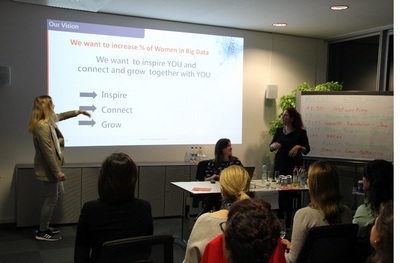 Astrid Neumann and Nahia Orduna, WiBD Munich leads, introduced the Women in Big Data organisation and explained the vision behind it, and also discussed Big Data and the many different careers it fosters. 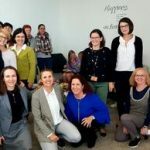 There are so many job vacancies in general (and specifically in Munich area) that are well paid and very exciting, and it’s time for women in the community to take advantage of these opportunities. Examples of Big Data positions can be found in HR, marketing, finance, sales or IT areas, to name a few. Jamshed Khan, VP Marketing at Gemalto, delivered a presentation on the topic “Data puts you in the driving seat – but only if you have the skills to use it.” Businesses across the globe, from the UK to the US and Japan, are all facing a data skills gap crisis. Whether it’s everything-as-a-service, outcome contracts, software licensing, subscription modelling or simply pay-as-you-go, the ways end users interact with vendors are changing, and the combination of software and connectivity allows manufacturers access to a new, powerful asset: DATA. However, nearly half of businesses (47 per cent) don’t have the skills to analyse the data they have or will collect. Businesses are also struggling to hire staff with the right skills to fill these gaps and turn the data they hold into insights. But the solution isn’t simply to hire someone with data skills alone. Jamshed discussed which skills are needed in data management, analysis and security, and why. The presentation was very entertaining and there were many examples that resonated in the audience. 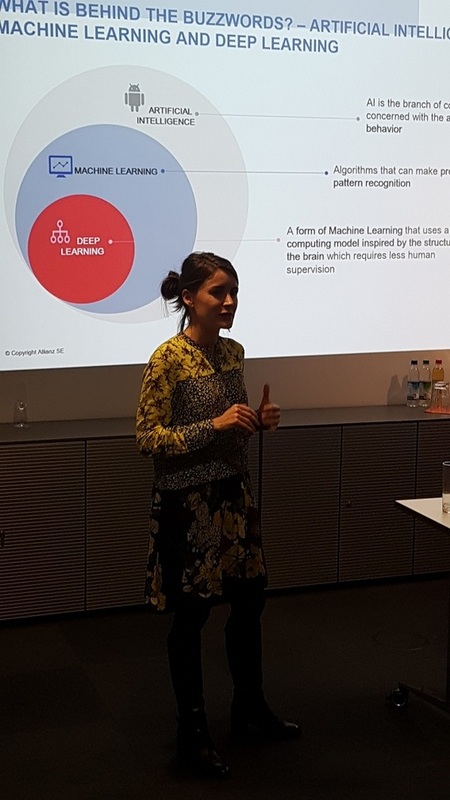 The next speaker was Gemma Garriga, Head of Big Data at Allianz, who talked about “Generating impact with A.I. in the insurance business”. 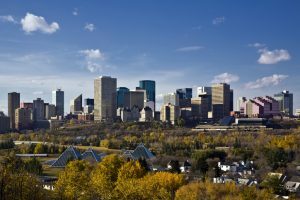 Data has without a doubt become one of today’s key strategic assets. As a global insurance company, Allianz wants to use our data to create business impact and value for our customers, from improving efficiency of internal processes to redefining a new customer experience. With the help of advanced analytics and new data technologies, we have new tools at hand to make best use of data in the insurance business. In this talk, Gemma identified areas of the insurance business that can be automated with the help of AI, and how this is turning the business model upside-down. Besides theory, she was also deep-dove into the area of claims, with a live demo illustrating AI in the insurance business in action. She also shared her personal and professional journey to the position she has now, which made the topic even more interesting. A real role model as a Woman in Big Data, Gemma was surrounded during breaks by many attendees who wanted to connect and learn from her. 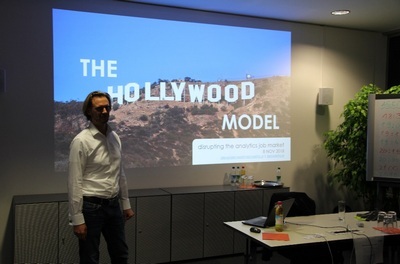 The next speaker was Alexander Heidl, Founder & Managing Partner at AlphaZetta, who talked about “The Hollywood Model – disrupting the analytics job market”. Whether it is a revolution can be debated, but there is a clear shift in the market towards new engagement models, especially in the analytics domain. The reasons are manifold; it may be the expert’s desire to choose customers, managers, projects and the freedom to roam around, or it may be that businesses are demanding analytics skills when and where they are needed; for some the gig economy is a blessing, to others it is a scary nebula. In this talk, Alex reflected on the pros and cons of the gig economy and set a spotlight on what we can learn from Hollywood to master the transition from a classic employment model to more independence and freedom. His bold approached captivated the audience, who were asking many questions and wanted to follow up with him. It was already 9pm when Katharina Brass, from the Women in Big Data Munich team, started a very funny and interactive game. She challenged the audience with seven questions related to the talks of the speakers, and they had to answer through an online game on their mobile phones. The questions were sophisticated, and the three fastest people who had correct answers won three great prizes. First prize was a coaching session with Katharina herself, who is a coach and Business Consultant at Dassault Systèmes, and the lucky winner could not be happier. The second and third prizes were kindly provided by Gemalto and Allianz. Not only were the winners very excited, but the whole atmosphere was very positive. Finally Pat Piritburana, also from the Women in Big Data Munich team, and a Product Owner in Intel and founder of SpaceNeo, wrapped up the night, encouraging attendees to provide feedback by filling out a survey and to connect to Women in Big Data through Social Media. And there was still some time for networking, food and drinks. 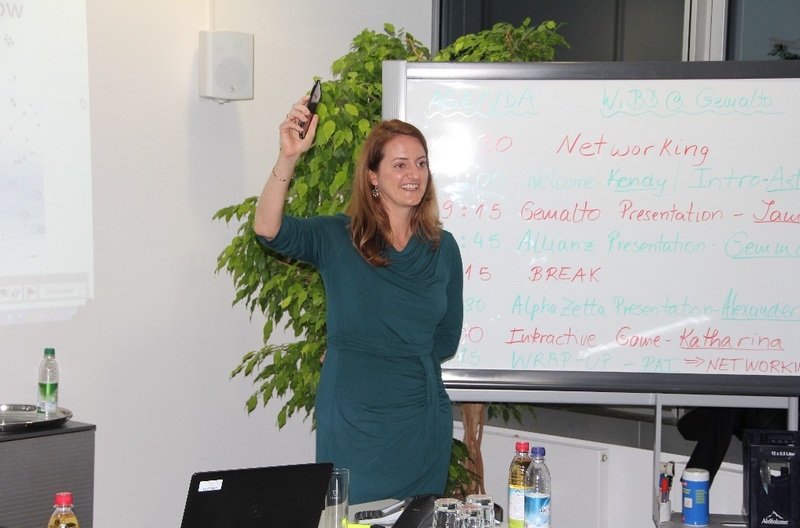 Women in Big Data Munich is looking forward to organising more events in 2019, and we’re very happy to count Gemalto as a new partner. Many male executives from Gemalto joined the session, including Michael Zunke, CTO, Pedro Ferreira, HR Manager, Ansgar Dodt, VP Strategic Development, and many more. 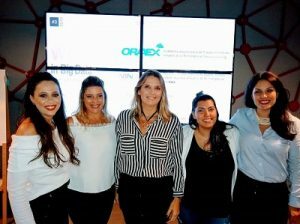 They were very impressed by the quality of the WiBD event, and we thank everyone at Gemalto for their continuing support.